Manchester United striker Anthony Martial wants to stay at the club and fight for a place in Jose Mourinho’s starting XI this season. Martial signed for the Red Devil’s from AS Monaco in 2016 for £36 million – as per BBC Sport – and the Frenchman has gone on to appear 166 times for the club. The 22-year-old has also managed to score 36 goals during that time, developing a strong reputation as a clinical finisher with a fantastic turn of pace. Last year he endured a difficult season under Mourinho despite starting the 2017-18 campaign strongly, only managing to feature twice in United’s last ten games, which cost him a place in France’s World Cup squad and thusly the opportunity to become a World champion. 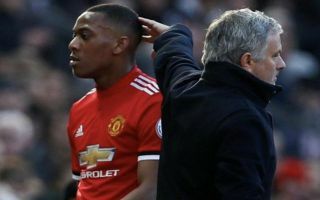 There has never been any doubt about the talent that Martial possesses but in recent times he has appeared to be at odds with his Portuguese manager, who has often favoured the likes of Alexis Sanchez, Marcus Rashford and Romelu Lukaku for inclusion over him. According to The Sun, the French international’s agent stated in the summer that Martial was seeking a move away from Old Trafford but they also report that he has now had a change of heart and wants to fight for his place in the team. The young attacker played 60 minutes of United’s 3-2 defeat away at Brighton on Sunday and didn’t cover himself in glory with his performance, but if he can somehow rediscover his goalscoring touch he could help the team turn around its fortunes. Mourinho has been criticised for not playing ‘the United way’ during his tenure and Martial is definitely the kind of player that can help turn that reputation around if he can build up his confidence again, which supporters will hope he can do in the coming weeks.